Mexico is a staple getaway destination, with its lovely sand beaches, sunny weather, delicious food and friendly people. The relative low cost of land and labour means that companies have been able to build excellent hotels and all-inclusive resorts without having to price out most of the travel market. Modest budgets can still find excellent spot s for a relaxing holiday. And Mexico offers more than just relaxation and great food. 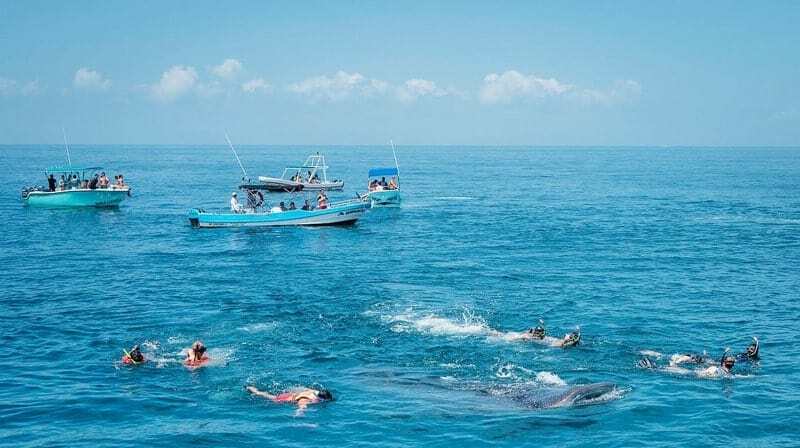 The Gulf of Mexico is a warm-water area, and as such is a frequent grazing ground of one of the ocean’s most endearing – and impressive – residents… the whale shark. At an average length of just over twelve metres, and almost thirteen and a half (Imperial) tons, the whale shark holds the title of the world’s largest fish. Despite its great size – and its membership in one of the scariest groups of fish – it is in reality a gentle giant. Feeding on plankton and small fish that are filtered out as it draws in great mouthfuls of water and squeezes them out again, the whale shark is not aggressive to humans at all. Due to its great size, it also isn’t afraid of predators. Its life is one of peace and slow movement, gliding through the ocean, gathering food to fuel its massive body. Their mouths can be a metre and a half wide, and are located at the very front of their heads, rather than on the bottom, like most sharks. When they open up, it looks like you could drive a car in there! Whale sharks take about thirty years to reach sexual maturity, and we estimate that they live about seventy years in total. They range all around the globe, wherever the water is warmer than twenty-one degrees. They can dive as deep as 1800 metres, but – lucky for those who want to swim with them – spend most of their time near the surface, where the plankton and small fish are more plentiful. Can I Really Swim with One? Whale sharks are unafraid of close proximity with humans in the water, and don’t seem to mind people swimming around them while they go about their daily business. Snorkelers and divers alike can get up close to the animals, getting a clear look at the pale white stripes and dots covered the grey skin. In the past, swimmers have even caught rides on them, grasping a fin and being towed along through the water. Shark scientists and conservationists discourage this practice now, however, as it is thought to disturb the animals. With this assurance in mind, however, getting close to one of these big creatures can be a safe yet exhilarating experience. Though robust estimates of their population are difficult to make, whale sharks are considered endangered, due to damage to habitat and devastation of fish stock by industrial fishing practices. This makes un-harmful tourism – like swimming with them – very important. Supporting a means of generating money without harming the sharks or their environment makes it more financially viable to add protections to whale sharks and their food sources. It may not seem like your choice to visit these animals could make much difference, but it does. Many areas around the world have been set aside as natural preserves based on their popularity to tourists alongside ecological importance. 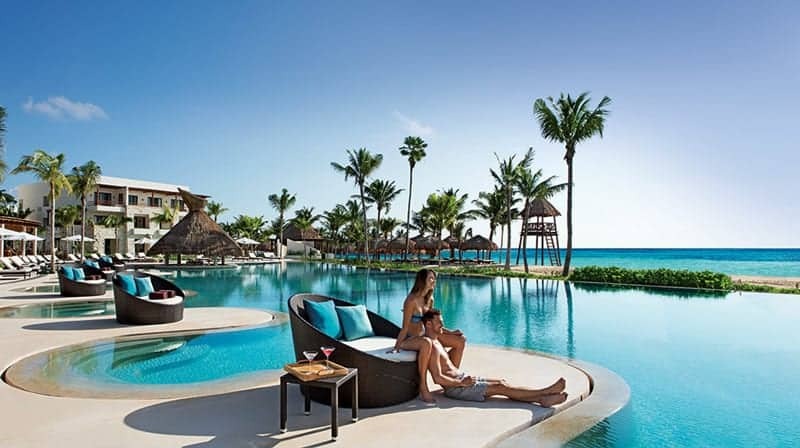 Most all-inclusive resorts are set on secure grounds. You’ll come in a coach from the airport and alight in a compound specially designed to cater for your every need in a trouble-free manner. You’ll have a cool room with a private bar fridge, restocked regularly; private balcony, often equipped with a hammock or two along with lounging chairs; a comfortable bed and twenty-four-hour housekeeping and room service. The compound itself will likely feature several restaurants of different types, allowing you to try local foods of various kinds, familiar favourites from your home country, and treats from around the world. The fruit will be fresh and sweet, and there is never a lack of refreshing beverages, both alcoholic and virgin. Wherever you are in the compound, the facility’s 24-hour service will be available, providing whatever you need to make your holiday a fun and relaxing experience. Resorts usually include a number of pool areas spread over the grounds. Some will be lively and maintain a party vibe, while others will be alive with the chatter and squeals of children, and still others quiet and serene. Whatever your mood or preference, there will be a suitable spot to please. All pools will include poolside bars where water, soft-drinks and alcoholic beverages will always be available, along with coffee and tea. Food is sometimes available there as well. You might even be able to sit on submerged benches or stand in the water while you enjoy your drink. For a more active pastime, there are always exciting activities on offer, including jet skiing, parasailing, snorkelling and SCUBA-diving. Some of these carry extra fees, but not always. Some resorts have glass-bottomed boats that allow passengers to stay dry while watching underwater wildlife in its natural habitat. When it’s time for a break, some responsible sunbathing might be on order, or maybe an hour or two in an air-conditioned theatre or live show is more your style. Evenings can be filled with dancing, special performances, stand-up comedy, or friendly conversation in the warm air under the stars. Most resorts offer outside tours as well, taking guests to see ancient pyramids and other historical sites, natural wonders like high waterfalls or wildlife areas. Some tours also visit local markets or nearby urban areas to get a taste of regular Mexican life. Adding to the care-free, relaxing atmosphere, is that you won’t have to carry or worry about money while inside the resort compound. Most of them discourage or even prohibit tipping individuals (some provide for a shared tip to be added at the end of your time there). It is amazing how a break from daily commerce clears the mind of worry and allows a person to focus on the fun and adventures at hand. Adventures like swimming up to a friendly, fourteen-thousand kilo shark in the open water. It’s a holiday you will never forget, as Meon Valley Travel team members Karen Barnes and Ed Texier will tell you.